Old Dominion Animal Hospital donates free or discounted veterinary services to animal rescue groups every day. Giving back is a big part of who we are! We donate cash from our fund-raising events in addition to in-hospital veterinary services. Old Dominion Animal Hospital has also donated a significant amount of donations to local pet rescue efforts. We continue to be active as a group and individually in community events. We also proudly sponsor the Companion Animal Fund (CAF). 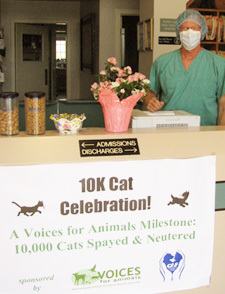 On April 15th, 2013 CAF funded the spaying of its 10,000th cat! Thanks to your donations, the Companion Animal Fund was able to fund the spaying of the 10,000th cat for the Voices For Animals organization on April 15th, 2013 at Old Dominion Animal Hospital. A little calico named Ginger was the special little girl to be honored as the 10,000th cat to be spayed. Her tabby brother Bubbles was neutered (becoming the 10,001st kitty! ), and another male, Oscar, was also neutered (10,002nd! ), but was unavailable for comment. We want to thank all of our donors, and especially Dr. Wood of Old Dominion Animal Hospital and Voices For Animals for their help in enabling so many pets to live better, healthier lives!